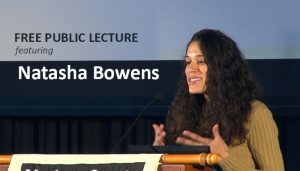 Natasha Bowens, author of The Color of Food: Stories of Race, Resilience and Farming, challenges us to reflect on our movement for good food and food justice. Her lecture will explore issues of justice and inclusivity in our movement while amplifying the role of communities of color and challenging the status quo of agricultural identity. Through sharing stories of farmers of color, Natasha teaches us that the good food movement is about more than buying local and protecting our soil – it’s about digging deep and discovering that true food sovereignty means a place at the table for everyone. Natasha Bowens is an author, grower and community activist who focuses on building empowerment and community through food and storytelling. Natasha spent five years gathering stories and portraits of farmers and food activists from Black, Latina, Asian and Native communities across the country – stories that invite us to dig deep into race, culture and community. Her work has garnered national attention such as The Atlantic, Mother Earth News, VICE, YES! Magazine and NPR. She has shared her work across the country from Purdue, Tuskegee and Harvard to the National Organic Farming Association and the USDA.